It was pouring on Monday morning 3rd February. As I drove to Lanseria to drop off two colleagues we noticed that parts of the road were being washed away in large chunks. It’s not often that bits of tar drift past your vehicle as you wait in rush hour traffic. I had initially wanted the driver to do this job but then thought why not head out to Lanseria just after dawn and go do some work in the Flight Sim or spend two hours studying – or something? But this is not a happy nor ditzy story – it ends in death. While we made our way slowly to the airport at 7.20am emergency vehicles desperately wound their way through the bits of tar, the raging stream and at the corner of River and Malibongwe road, taxi drivers who’d decided to shut down the highway. Who knows if that ultimately cost anyone inside ZS-CLT? For as we turned into the airport road, I noticed that emergency vehicles were halted on Alpha taxiway close to Execujet’s hangar. Oh no, not an incident. Then my phone rang and my wife asked if I was aware of the accident at Lanseria. 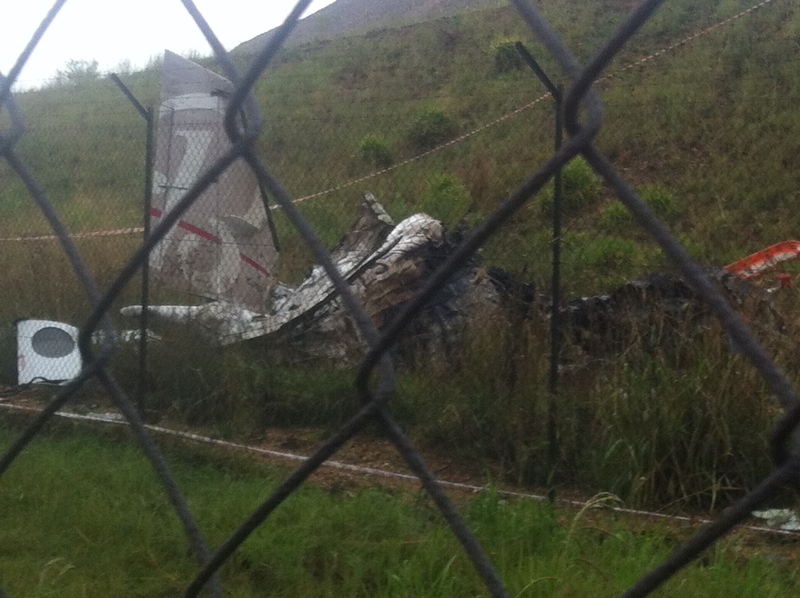 It’s always a shock to see parts of a plane lying so close to major airport. And the day! The sodden clouds were hanging close to minimas. The roads were awash and immediately thoughts were – was this an aquaplaning incident? 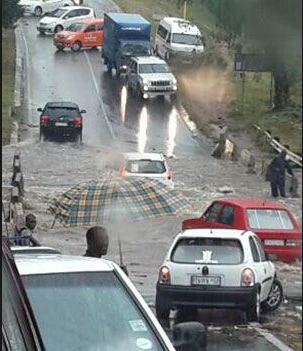 Some of the heaviest rain in months fell in a few hours in Johannesburg on the early morning of 3rd February. That’s called jumping to conclusions. I dropped off my colleagues then drove to a small slip road which is alongside Runway 07 and walked the kilometer along the perimeter fence to where I saw the wreckage of ZS-CLT. At this point, let’s get a few things straight. My day job is a business tv news editor and I know a few of the King Air operators at Lanseria. While it was raining and cool, I was sweating before beginning the long walk in the mud alongside the fence. What had led to this catastrophe for the crew of ZS-CLT? Was it someone I knew? What the hell!! It’s not the first time I’d seen a plane down alongside Lanseria. There has been an incident or two and that’s the same for most busy airports world wide. Undercarriages give way, wind shear causes tips, tail-draggers spin, bits of aircraft dislodge and land on the runway, and at times at Lanseria, foxes sprint across the threshold. The foxes don’t happen anymore as far as I’m aware, not since the double layer FAA approved fence. But people still land oddly with a bounce and sometimes depart the runway and that’s an incident. But this was a catastrophe for the crew and their families. The smell of fuel hung heavy as I approved the remains. 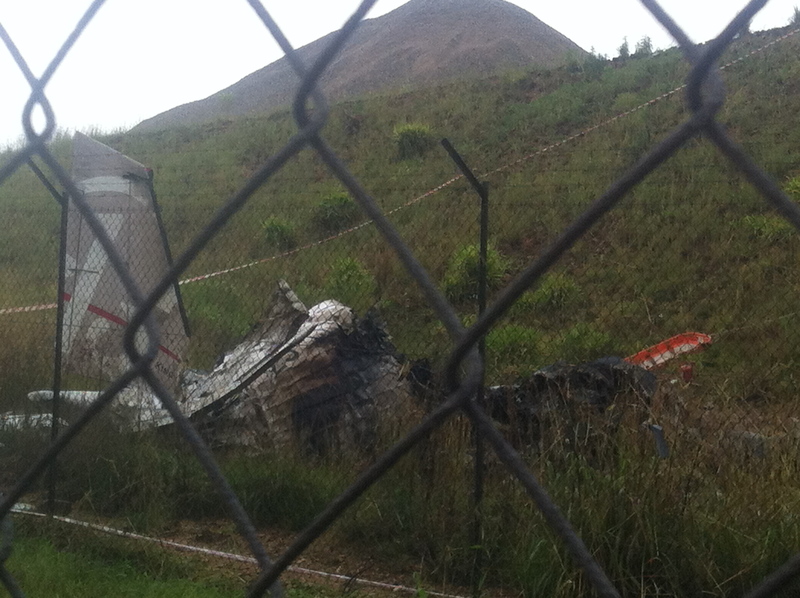 I stood at the fence a few metres away and it was obvious that the aircraft had burst into flames upon crashing. Three people had died – reportedly two crew and a passenger. ZS-CLT had apparently taken off from Rand airport not far away to the south, and was landing in the middle of a heavy Gauteng downpour. Accident 3rd February 2014. So sorry for the crew and their loved ones. I’m a beginner pilot. Just wet behind the wings. So I said a small prayer while the rain splashed down on the burnt out remains and made no judgement. Then the police hunkered down on the hill above yelled at me to leave the scene or I’d be arrested. I stumbled back to the road in a kind of shock, such a large turbo-prop plane had turned so quickly into a mangled tiny pile of bent aluminium. What of the aviators? What happened? Why did the plane appear to strike the north of the embankment? Yet they had been travelling from the south and the let down and break-cloud involves using the beacon to the west. Had they been sent to HBV to hold? That was to the north. Just so many questions and because I fly from Lanseria and am aware of the dangers – was looking for answers. It slid down the embankment from the right and stopped facing up the steep incline. Flying is not a game we play to show just how clever we are. It’s nothing but an extremely dangerous mix of machine, human and the environment. There is just so much chaos going on in the combination of human and environment. And occasionally, its the machine. This entry was posted in Uncategorized and tagged air crash, aviation, King Air, Lanseria accident, ZS-CLT by desmondlatham. Bookmark the permalink.